There’s a story behind this creation – my mum’s colleague tried my baked goods at work and asked me to prepare cupcakes for her wedding. As nervous as I usually am, I low-key panicked a little (okay actually A LOT) and have been wracking my brain to think about what I should make in order not to disappoint. Red Velvet? Carrot Cake? Oreo & Cream? As I started to get frustrated this idea suddenly popped up in my mind – thank God – and I decided to go along with it. I followed the instructions given by Tessa on https://www.handletheheat.com/how-to-make-perfect-swiss-meringue-buttercream/with some minor adjustment. If you happen to encounter problems while making your swiss buttercream (it happens), do check this link out http://www.thebrewerandthebaker.com/archives/7640. It was a great help for me. In a mixing bowl, sift and combine flour, hazelnut meal, cocoa powder, baking powder, salt. Set aside. Add eggs, one at a time, and continue beating for 1 min. Add coffee, milk and melted chocolate, vanilla, and cointreau. Continue beating for 30 secs. Turn to medium-low speed, gradually add the softened butter cubes, one at a time, until incorporated. Continue beating until a silky smooth texture is reached. Add Nutella and salt, and beat until well combined. 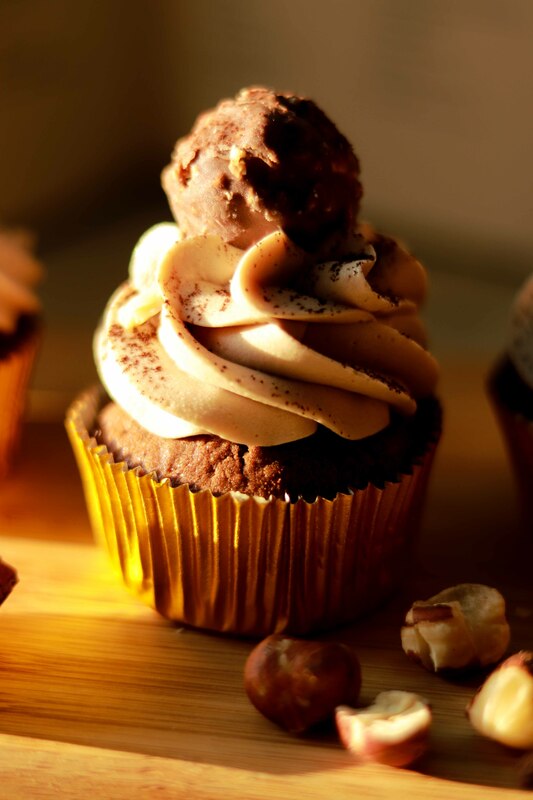 Pipe the buttercream onto the cupcakes with your favourite piping tip, and put a Ferrero Rocher, some chopped hazelnuts, and sprinkle sifted cocoa powder on top as decoration if desired. Thank you 🙂 I hope they’ll love it!